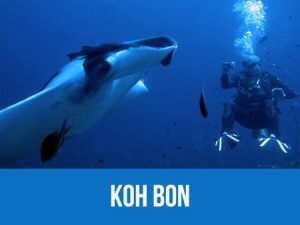 Get the most out of your Khao Lak diving experience by joining a diving day trip to Koh Bon and Koh Tachai with 2 or 3 dives in the crystal waters of the Andaman Sea. Koh Bon is a remote small uninhabited island which belongs to the Similan Islands National Marine Park. It’s located about 20 kilometers north of Similan Island No 9. The island has the shape of a horseshoe and no beaches. It is made of volcanic rock and over time waves and currents have cut some holes right through the island where you can see the waves surge through them both above and below the surface. 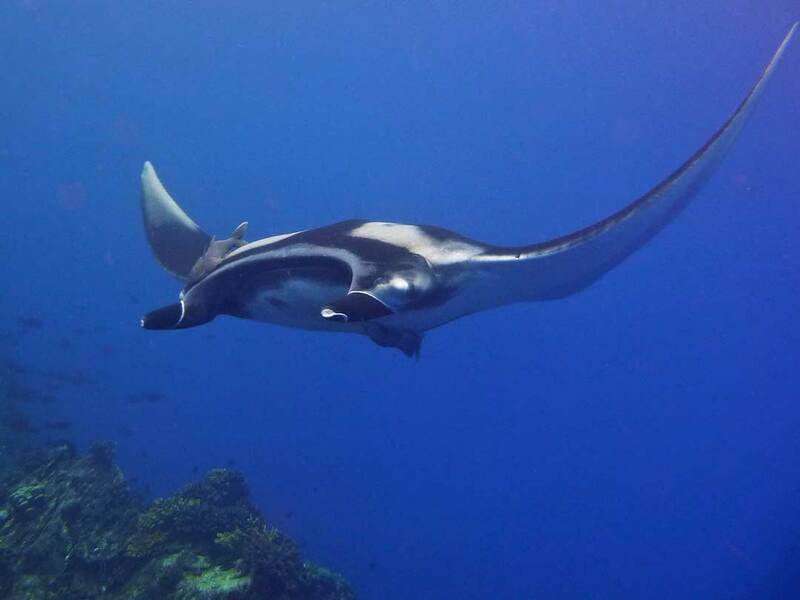 Around Koh Bon, there are a few different dive sites what also give you different types of diving (Wall, Slope, Reef, and Drift) and it is considered the number 1 place in Thailand to see Manta Rays. The West Ridge is the favorite amongst most divers and located at the southwest corner of the island. The southern part is a step-down wall that falls down to 40+ meters and is covered in tiny colorful soft corals and beautiful sea fans of different sizes, shapes, and colors. 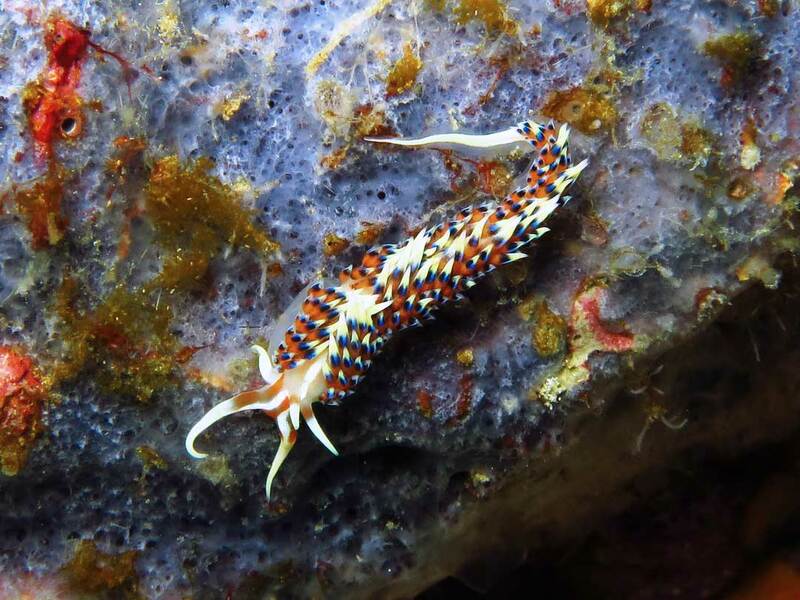 The cracks in the wall accommodate a vast amount of little critters like shrimps of all kinds, tiny crabs and many amazing nudibranchs. . . heaven for macro photographers, so makes sure you have enough batteries and a big memory card with you! The northern side of the ridge is more of a gentle slope with coral bommies forming mushroom-like formations out of the hard corals. Some of these big coral heads are covered in butterfly fish and known as cleaner stations for the majestic Manta Rays. They love to hang out with us, get cleaned and play with our bubbles; all you do is sit back and enjoy the show. The Reef slopes from a depth of 10 meters down to the sandy bottom at 25 to 30 meters. 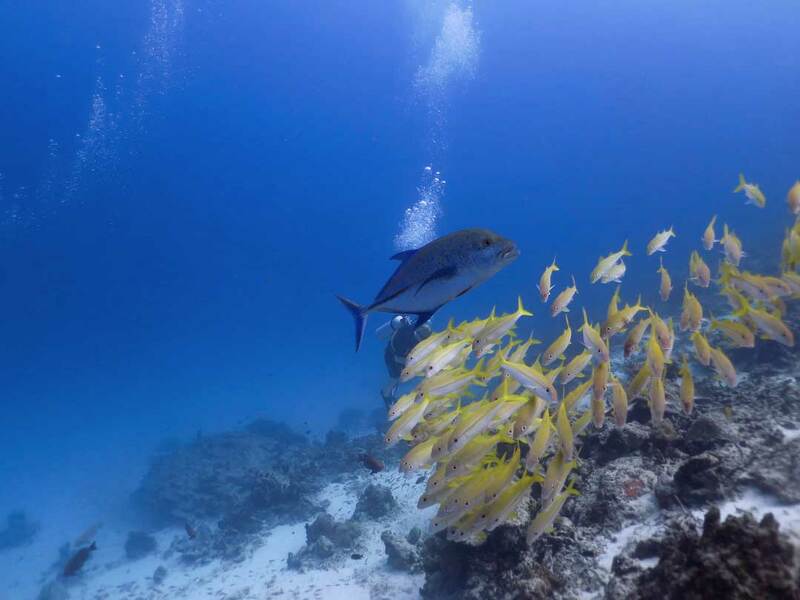 The majority of corals here are hard corals including staghorn coral, table coral, and brain coral and you will find an abundance of life due to the usually medium to strong currents but this is what brings in the big fish. Schooling fish like barracudas, trevallies, snappers, and batfish swim into the current and there two huge napoleon wrasses around as well. If you are really lucky you might even see a small Blacktip Reefshark or a Leopard Shark. The Bay is framed by the wall of the ridge to the north and a steep wall to the east and usually more sheltered from the currents. It’s home to many Red Tooth Trigger Fish, Giant Moray Eels and Banded Sea Snakes. Koh Tachai is one of the more northern dive sites and favorite by many divers. It is a small uninhabited island about halfway between the Similan Islands and the Surin Islands. The main features of diving here are a stunning landscape of the submerged pinnacles, large boulders, and the excellent marine life. This beautiful island provides a few dive sites which makes it suitable for every certification level, with Koh Tachai Plateau or ‘The Dome’ as the main dive site. It’s basically a gigantic round granite boulder (dome shape) with large boulders spread all around this central rock, creating swim-throughs, channels and coral plateaus rich in life. The top of the pinnacle is at 12 – 14 meters with a buoy for safe descent and drops down to the sand bottom at a depth of 30 to 40 meters, with the deepest area on the southern side. The top of the plateau is a big coral garden built with excellent specimens of hard coral while deeper parts are known to have many boulders, pinnacles, and the biggest and most beautiful sea fans and gorgonians in the entire Similan Island National Marine Park. It’s also a good place to spot Napoleon wrasses, giant groupers, turtles, black tip reef sharks, nurse sharks and occasional white tip or grey reef sharks. 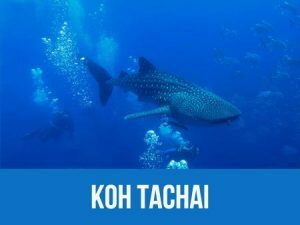 With stronger currents the majestic manta rays and the king of all marine animals, the whale shark show up around Koh Tachai. Other more common species such as great barracudas, yellow-backed fusiliers, bannerfish and hunting giant trevallies and tunas can be found here in large shoals. Between the rocks, you might see banded sea snakes, while different kind of moray eels and lobsters hiding in holes and crevices. Inside corals and cracks a vast number of small critters like mantis shrimps, ghost pipefish, nudibranchs, and even seahorses, waiting to be discovered. In the deeper water, you might even be lucky to find leopard sharks and different kind of stingrays resting on the sand. If you are an underwater photographer, you don’t want to miss out. . . bring the big memory card and enough batteries! Koh Tachai’s dive sites offer everything, from stunning landscapes to macro life and big fish encounters. 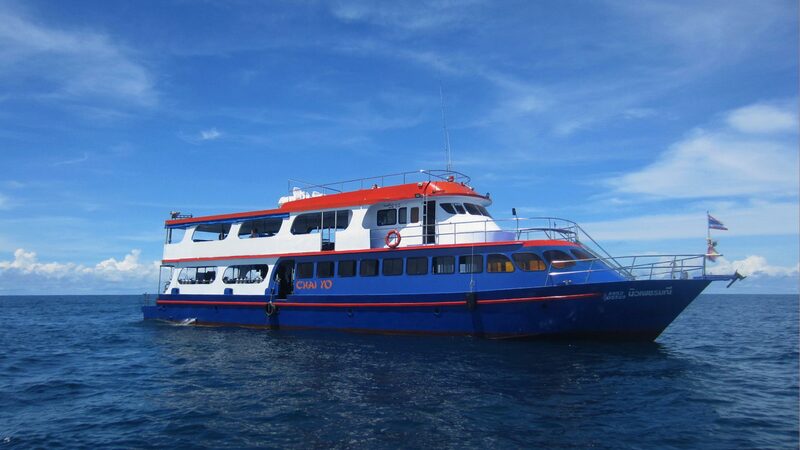 The boat for this Khao Lak scuba diving trip will be the MV Chai Yo, one of the spacious day trip boats around. This monohull day trip boat offers a comfortable ride; it takes about 2 hours to reach Koh Bon. The sundeck gives you extra space to relax during the surface interval. Dive groups are based on certification level and dive experience. In this way, everybody will feel comfortable: from novice open water diver to the more experienced diver. The ratio is 4 divers to 1 Dive Master. Each Dive Master gives a detailed dive briefing to his group and helps you with setting up your diving gear. Dive time will be 45-60 minutes. Between the dives, lunch is served on the boat and you get some time to tan on the sundeck, snorkel or just relax. After the second dive, you might exchange experiences with the other participants and fill in your log book while enjoying fresh fruits or having a cold drink. 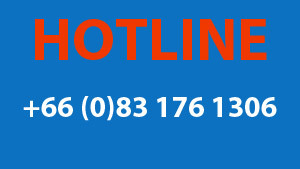 Pick up from your accommodation in Khao Lak. At 8.00 AM the MV Chai Yo leaves to Koh Bon from Tab Lamub pier. The travel time is around two hours. The friendly and experienced crew welcome you onboard on the comfortable dive boat. The boat master gives a short boat briefing and a breakfast is served. Dive groups are based on certification level and dive experience. In this way everybody will feel themselves comfortable: from novice open water diver to the more experienced diver. The ratio is 4 divers to 1 Dive Master. Each Dive Master gives a detailed dive briefing to his group and helps you with setting up your diving gear. Plunge into the crystal clear water and enjoy the incredible marine wildlife. Dive time 45-60 minutes. Back onboard a lunch is served . During the surface interval there is to relax or to sunbathe on the sundeck. Time for the second dive, your Dive Master gives a detailed dive briefing and will help you with gearing up. Plunge back into the water and get the experience of world-class diving. After the last dive fresh fruit are served. The MV Chai Yo starts returning back to Tab Lamub pier. This will give you enough time to fill in your logbook, exchange experiences and have a drink The arrival time is around 17.00 PM . A taxi is waiting to bring you back to your accommodation in Khao Lak. Schedule can be changed due weather, sea conditions, instructions by the national park authorities.